White earthenware vase, cylindrical, straight-sided with concave upper part and straight-side rim. On the body and rim with silk screen-printed decoration of a repeating pattern of squares and circles in browns and blues on white, the upper part and interior left white. 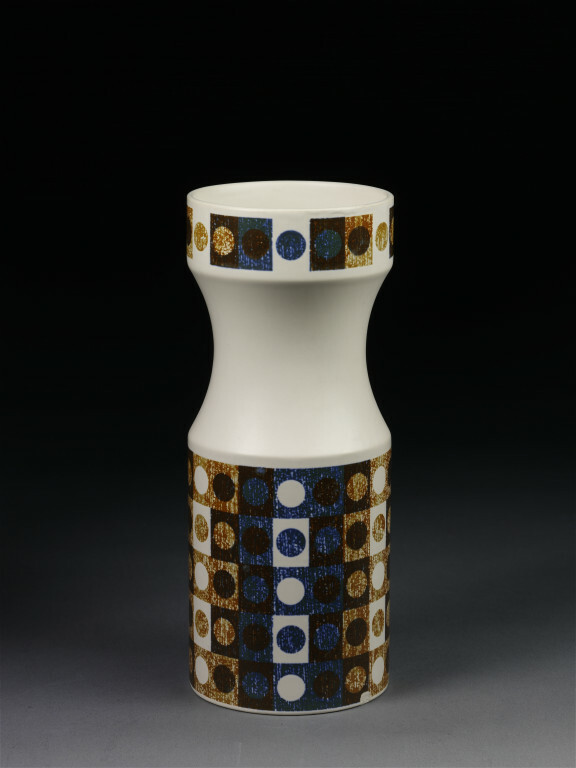 This vase is part of the gifts, consisting 44 objects, arranged privately by John Clappison, chief staff designer at Hornsea. The selection was made by John Mallet and Jennifer Opie, most of the ceramics then being housed in John Clappison’s garage and cellar, the remainder under his care at the Pottery. In 1986 the Pottery was in some difficulties and Mr. Clappison was then alone in seeing the need to save these examples of the factory’s production. The titles given are those used in-house by the factory. 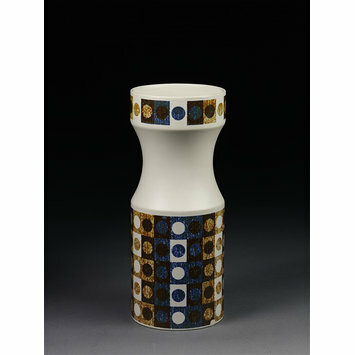 'Studiocraft' vase, glazed earthenware with direct screen-print decoration,by Patrick Rylands, 1966. Shape designed by William John Clappison, 1965, made by Hornsea Pottery Co. Ltd., England, ca. 1966.